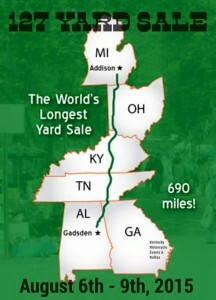 I got tangled up in the world’s longest yard sale last weekend without really wanting to. A trip to Danville, Kentucky to celebrate granddaughters June and Clara’s birthdays happened to fall during the four days of the famous Highway 127 Corridor Sale. Since that road is the best way to get where I was headed, I found myself smack dab in the middle of all the excitement. Though I’d known about the yard sale for years, I’d never until now been brave enough to battle the heat and heavy traffic in order to experience it firsthand. But since I was travelling the route anyway and since I was in no particular hurry and since I’m always on the lookout for a column, I figured what the heck. Maybe I’d come across a hidden treasure in the midst of all that junk. Way back in 1987, Fentress County executive Mike Walker came up with the idea of a gigantic community yard sale as a way to promote tourism. The notion took off and has grown in size and enthusiasm every year since. The 127 Corridor Sale now stretches 609 miles, beginning in Gadsden, Alabama and traversing five states to its terminus in Addison, Michigan. Experiencing the 80-mile stretch from Albany, Kentucky to Danville was enough for me. My first quandary was trying to figure where to stop. Did it make more sense to shop at individual yard sales or to wait to come upon a site where several vendors were set up? Should I shop only on the east side of the road Thursday and then tackle the west side on the way home Sunday? If I sped by what looked to be an interesting place, should I try to turn around and go back? Would I be inviting a rear-end collision if I drove slowly enough to try to figure out what kind of stuff various vendors were offering? The planning and scheming was all for naught. On opening day, it rained so hard and so steady that even those vendors set up under tents had their wares shrouded in plastic. There would be no shopping for me that day. But the weather cleared on Friday and I ventured out with grandson Eli, who’s almost three, to the Boyle County fairgrounds. We were on the hunt for an inexpensive but sturdy toddler-size table and chairs set that he could use for coloring, working puzzles and eating snacks. In the dozens of booths that dotted the fairgrounds, we found everything but. Glassware and dishes. Fake fall flowers. Framed art. Antique tools. New tools. Fishing gear. Guns. Knives. Swords. Plastic baby toys. UK Wildcats fan gear. Kentucky Derby memorabilia. Clothes and shoes. Purses and belts. Lamps. Records and CDs and videotapes and DVDs. Cast iron skillets. Rusty bicycles. Avon products. Socks. Camo gear. Live rabbits. Geodes. Costume jewelry. Ball caps. Old magazines. Beat-up furniture. Confederate flags. Lots and lots of Confederate flags, despite the fact that Kentucky never seceded from the Union. But not one toddler-size table and chairs set. Ditto for the multiple-vendors sale set up in the movie theatre parking lot, where I did find one item I just couldn’t pass up—a bluebird house fashioned from a Tennessee license plate. I also bought several ears of just-picked (or so the sign said) Silver Queen corn and a pack of poker cards so that Eli and I could play the sort-the-deck-into-suits game if and when we ever found a little table. As to what gems I discovered on the west side of Highway 127 on the way home, the answer is nothing. I was just too weary to look for hidden treasures amidst all that junk.